You’ve hired an attorney to draft your will, inventoried all of your assets, and have given copies of important documents to your loved ones. But your estate planning shouldn’t stop there. Regardless of how well your will is drafted, if you do not take certain steps regarding your non-probate assets, you run the risk of unintentionally disinheriting your chosen beneficiaries from a significant portion of your estate. A will has no effect on the distribution of certain types of property after your death. Such assets, known as “non-probate” assets are typically transferred upon your death either as a beneficiary designation or automatically, by operation of law. For example, if your 401(k) plan indicates your spouse as a designated beneficiary, he or she automatically inherits the account upon you passing. In fact, by law, your spouse is entitled to inherit the funds in your 401(k) account. If you wish to leave your 401(k) retirement account to someone other than a surviving spouse, you must obtain a signed waiver from your spouse indicating her agreement to waive her rights to the assets in that account. Other types of retirement accounts also transfer to your beneficiaries outside of a probate proceeding, and therefore are not subject to the provisions of your will. An Individual Retirement Account (IRA) does not automatically transfer to your spouse by operation of law as is the case with 401(k) plans, so you must complete the IRA’s beneficiary designation form, naming the heirs you want to inherit the account upon your death. Your will has no effect on who inherits your IRA; the beneficiary designation on file with the financial institution controls who will receive your property. Similarly, you must name a beneficiary on your life insurance policy. Upon your death, the insurance proceeds are not subject to the terms of a will and will be paid directly to your named beneficiary. Probate avoidance is a noble goal, saving your loved ones both time and money as they close your estate. In addition to the assets listed above, which must be handled through beneficiary designations, there are other types of assets that may be disposed of using a similar procedure. These include assets such as bank accounts and brokerage accounts, including stocks and bonds, in which you have named a pay-on-death (POD) or transfer-on-death (TOD) beneficiary; upon your passing, the asset will be transferred directly to the named beneficiary, regardless of what provisions are in your will. 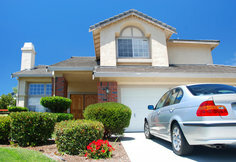 Depending on the state, vehicles may also be titled with a TOD beneficiary. To make these arrangements, submit a beneficiary designation form to the applicable financial institution or motor vehicle department. Be sure to keep the beneficiary designations current, and provide instructions to your executor listing which assets are to be transferred in this manner. Most such designations also allow for listing of alternate beneficiaries in case they predecease you. Another common non-probate asset is real estate that is co-owned with someone else where the deed has a survivorship provision in it. For example, many deeds to real property owned by married couples are owned jointly by both husband and wife, with right of survivorship. Upon the passing of either spouse, the interest of the passing spouse immediately passes to the surviving spouse by operation of law, irrespective of any conflicting instructions in your will. Keep in mind that you need not be married for such a provision to be in effect; joint ownership of real property with right of survivorship can exist among any group of co-owners. If you want your will to be controlling with regard to disposition of such property, you need to have a new deed prepared (and recorded) that does not have a right of survivorship provision among the co-owners. You’ve spent a lifetime of hard work to accumulate your assets and it’s important that you take all necessary steps to ensure that your wishes regarding who will get your assets will be honored as you intend. Carve a few hours out of your busy schedule, several times a year, to review all of your deeds and beneficiary designations to make certain that they remain consistent with your objectives.